Wearing the best scuba fins will help you in a wide variety of ways. It will give you more power and flexibility in the water. You’ll have more control. You’ll be able to kick in a natural style that will keep leg strains, fatigue, and ankle pain at a minimum. In short, the best scuba fins are going to let you maneuver in any water environment with complete comfort as you stay in control of every movement that you make. Scuba fins might seem like a pretty basic snorkeling or diving item, but some swim fins are just made better than others. This chart will help you find the right scuba fins to meet your particular needs right now. Most people are able to find a good pair of scuba fins without much difficulty. As long as they secure tightly, provide comfort, and give you strength and control in the water, you’ll have a good set of fins. What separates the better from the best is knowing what the care basics are for the fins so that they stay in good working order. First and foremost, you need to make sure your fins are stored where sunlight can hit them. This will cause the fins to degrade, create discoloration, and potentially even make the composite materials weaker because the light breaks down the bonds of the materials. You’ll also want to make sure that all of your straps, buckles, and blades are clean when being stored. When you receive your scuba fins, they’ll usually have a foot-pocket insert placed in the fin. Do not throw these inserts away. They can be used during times of storage so the fins are able to keep their shape more effectively. Store your fins somewhere flat as well so the blades don’t wind up with a crease in them that you can’t get out. What Are the Advantages of the Best Scuba Fins? You’re going to be finding three basic types of scuba fins on the market today. Thermoplastic elastomer fins are very lightweight and provide power because they are rather stiff and resist the water pressure pretty effectively. All-rubber fins are very flexible and provide for more natural movements, but are also very heavy and lend to swimmer fatigue. Fusion fins combine both elements in a unique percentage so that a more tailored experience can be enjoyed. What works best for you depends on your leg strength, water environment, and natural kicking style. The advantage here is that with so many diving fins available, the best diving fins are often just a click or two away right now. With prices starting around $20, it also isn’t going to cost you a lot to get some extra power with every kick. These swim fins might be on the entry-level price point, but they’re still some of the best diving fins that you’re going to be able to find. The shorter blades of this design allow for faster kicks and this provides a surprising amount of propulsion in the water. For those that are looking to swimming as an exercise routine, these fins will provide some extra stamina and kick up the heart rate a bit more for conditioning purposes. A fluid separator rounds out the design so that water can be sliced through quickly without the same levels of fatigue that other fins produce. They’re just a great design at a great price. These diving fins are longer than your average swim fins because they are designed for long-distance diving. Other swimmers might enjoy using them, but the extra length and the level of flexibility in the blade is perfect for those deeper dives where control and fatigue are important considerations. Because of the extra length, less muscle effort is required at depth to control movement, allowing for a diver to last even longer. With more power from less demand, it’s easy to see why these are some of the best diving fins around right now. 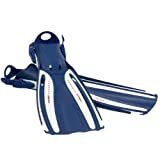 If you’ve been reading the scuba fin reviews and you’re not sure which items to consider because you like many water sports, then these are the swim fins for you. With a flexible amount of power thrust thanks to a built in channel that takes water off the tip of the blade, stress is reduced while acceleration is increased. The foot pocket has a surprising amount of room in it to create a better fit for several foot styles and the quality is high enough that you’ll be able to pass your diving certification while using this fins. If you’re looking for the best combination of efficiency and power in your diving fins, then these full foot scuba fins are a great option. Not only do they come in a wide variety of bright colors, but also they wear more like a shoe than other diving fins. With fewer troublesome buckles that could get dislodged or broken during a swim, divers, snorkelers, and other swimmers are going to find a lot confidence available to them with every stroke. Three channels help to move water efficiently and the performance of the Tecralene gives users of these fins a fun, enjoyable experience. These are the swim fins that are designed for the diving professional. With a high performance design and flexible materials, each kick is fluid and soft. This allows for long-distance swimming that isn’t tiring and the lightness does not affect how the propulsion is dispersed. Although these are an investment for some budgets, the price is worth it. These are easily some of the best diving fins available today. The best scuba fins come in all different shapes, sizes, and materials. By taking care of your fins and selecting a design that works best for your kicking style, you’ll be able to enjoy a full day of water recreation without a problem.